Approximately 4 million people travel to Israel each year. Many are Christians who come to see the Holy Land and walk in Jesus’ footsteps. If you are planning on heading over there, here are our recommendations for must-see places to visit in Israel. The Sea of Galilee, also known as Lake Tiberias and Lake Kinneret, is the largest freshwater reservoir in Israel, and it is where Jesus accomplished numerous miracles. The Jordan River enters the lake from the north and flows out again at the southwestern end of the lake, where it flows through the Jordan Valley and south to the Dead Sea. The Yigal Alon Museum, also known as the Jesus Boat Museum, is home to an ancient fishing vessel from the 1st century AD that was discovered in 1986 and dubbed the “Jesus boat.” The museum is located on the grounds of Kibbutz Ginnosar, not far from Tiberias. Capernaum, situated on the shores of the Sea of Galilee, is mentioned several times in the Gospels as the scene of many miracles and sermons. St. Peter’s House and the ruins of an ancient synagogue are fascinating pilgrimage sites. Tabha, not far from Capernaum, is the site of the Church of the Multiplication, famous for its incredible mosaics commemorating the miracle of the multiplication of the loaves and fishes. Magdala, an ancient city (known today as Migdal) on the shore of the Sea of Galilee, was probably where Mary Magdalene came from. Cana is famous for being the site of Jesus’ first miracle, the transformation of water into wine at a wedding feast. Nazareth was the childhood home of Jesus and is a center of Christian pilgrimage, with many shrines commemorating Biblical events. Caesarea is important for being the place where the first gentile was converted to Christianity. The archaeological site has a Roman amphitheater, port, hippodrome, and aqueduct. Beit She’an is one of the oldest cities in Israel and is often missed by tourists. This is a shame because the city has played an important role in history due to its strategic location at the junction of the Jordan River Valley and the Jezreel Valley. The city changed hands many times under the the Egyptians, Romans, and Byzantines, to name but a few. In the Biblical account of the battle of the Israelites against the Philistines on Mount Gilboa, the bodies of King Saul and three of his sons were hung on the walls of Beit She’an. The ancient city ruins are now protected within the Beit She’an National Park. When you visit you’ll see the ruins of ancient temples, bath houses, street colonnades, amphitheaters, a Crusader fortress, and much more. Old Jaffa Port (also known as Namal Yafo) is one of the oldest ports in the world. It was the port of the ancient city of Jaffa, out of which modern day Tel Aviv has grown. Perched on top of a hill overlooking the Mediterranean Sea with a natural harbor, Jaffa was a strategic prize. It was conquered and re-conquered countless times by Canaanites, Phoenicians, the Pharaohs, King David, the Assyrians and more. Old Jaffa is also notably the port from which Jonah set sail in the Biblical story of Jonah and the Whale. The Dead Sea, about 1,300 feet below sea level, is the lowest point on earth. Here you can float in the world’s saltiest body of water and enjoy the natural therapeutic and health benefits from the nourishing minerals and the bromide-rich air. The Dead Sea is also a must-visit destination for its Biblical connections. The Dead Sea Scrolls were discovered in caves at Qumran, an archaeological site in the West Bank managed by Israel’s Qumran National Park and rich with 2,000 year-old ruins. Mount Sodom, Israel’s largest mountain, is located to the west of the southern basin of the Dead Sea, part of the Judaean Desert Nature Reserve. Lot’s Wife, an eroded salt formation atop Mount Sodom, is a reminder of the Biblical story of Sodom and Gomorrah, believed to have been located nearby. Malham Cave beneath Mount Sodom was recently found to be the longest single natural salt cave in the world, and it is also the longest known cave in Israel. Masada is an ancient fortification in the Southern District of Israel situated on top of an isolated rock plateau, akin to a mesa. It is located on the eastern edge of the Judaean Desert, overlooking the Dead Sea about 12 miles east of Arad. Herod’s mountaintop palace and fortress at Masada was the site of the last Jewish stand against the Romans in 73 AD. The Old City of Jerusalem is surrounded by a high wall (rampart) and it has 8 Gates: New Gate, Damascus Gate, Herod’s Gate, Lions Gate, Golden Gate, Dung Gate, Zion Gate, and Jaffa Gate. Jaffa Gate is the main gate; you will probably enter the old city through Jaffa Gate if you arrive from the city center. There is a Tourist Information Point just to the left, when you enter the Jaffa Gate. The Western Wall (aka The Wailing Wall), located in the Jewish Quarter in the Old City of Jerusalem, is considered Judaism’s holiest site. One section is reserved for men and another for women. It is a custom to put notes between the stones with written prayers and wishes. The Western Wall Tunnel is an underground tunnel exposing the full length of the Western Wall, revealing the methods of construction and the various activities in the vicinity of the Temple Mount. Travel 2,000 years back in time and discover the ruins of the Second Jewish Temple. 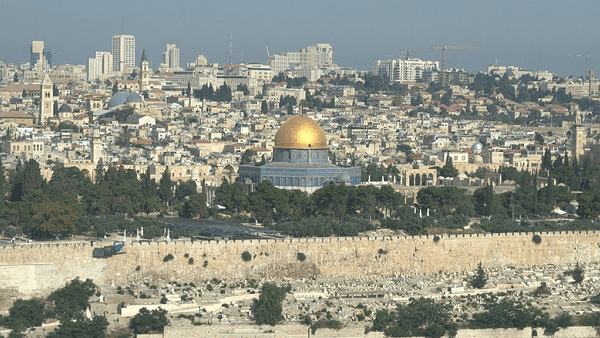 The Temple Mount is a hill located in the Old City of Jerusalem that for thousands of years has been venerated as a holy site in Judaism, Christianity, and Islam alike. The site contains two famous mosques: Dome of the Rock and Al Aqsa. The two Jewish temples that once stood here were destroyed; all that’s left is a flat plaza surrounded by retaining walls (including the Western Wall) which was built during the reign of Herod the Great for an expansion of the temple. Jewish tradition maintains it is here that a third and final temple will also be built. In the Jerusalem Archaeological Park, located near the Western Wall in the Old City, you will find many layers of archaeological finds and displays from Jerusalem’s multi-period history which literally lets you descend through the tiers of time. See the ancient city wall, the Temple’s staircase, a preserved ancient street, and much more. The Archaeological Park covers the area from the Temple Mount on the north, the slope of the Mount of Olives and the Kidron Valley on the east, and the Valley of Hinnom on the west and the south. Underground Jerusalem is an archaeological site located adjacent to Jerusalem beneath the neighborhood of Silwan, exposing parts of a water system dating to Bible-era Jerusalem. Visitors seeking adventure can trek through knee-deep water in King Hezekiah’s 2,700 year old water tunnel, one of the wonders of early engineering bringing water to the people within the city walls. Mount Zion, a hill just outside the walls of the Old City, is the site of some very important events in the Gospel including the Last Supper, the Institution of the Eucharist and the Pentecost. The Pool of Bethesda, just north of the Temple Mount, is where Jesus healed an infirm man on the Sabbath. These same five colonnades were described by John in Chapter 5 of his gospel. The Garden of Gethsemane, where Jesus spent his last hours praying before he was arrested, lays at the foot the Mount of Olives, from where Jesus had descended in his triumphal entry into Jerusalem. Near the top of the Mount of Olives is the Chapel of the Ascension, on a site that is traditionally believed to be the spot where Jesus ascended into Heaven after his resurrection. Perhaps the high point of every pilgrimage is honoring the Passion of Christ. Along the famous cobble street Via Dolorosa—Latin for “Way of Suffering”—thousands of parishioners walk the path Christ is believed to have taken on His way to Golgotha (aka Calvary). The last five stations of the 14 Stations of the Cross along the Via Dolorosa are in the Church of the Holy Sepulchre. Bethlehem, the birthplace of Jesus, has been a prime destination for Christian pilgrims for centuries. The main site in Bethlehem is the Church of the Nativity on Manger Square, built over the grotto where Jesus was born. The famous Shepherds’ Fields are also located near Bethlehem. The Mount of Temptation, near Jericho, is where Jesus went into the wilderness and was tempted by the devil. It’s also known as “Mount Quarantal,” which means 40, in reference to Jesus’ fast of forty days and forty nights. Quarantal Monastery stands half way up the mountain. Bethany was the village of Mary, Martha and Lazarus. The Franciscan Church, dedicated to St Lazarus, is close to The Tomb of Lazarus. Qasr el Yahud is where John the Baptist baptized Jesus in the Jordan River. A path to the river here was cleared of mines and re-opened to tourists and pilgrims in 2011 after being closed since the Six-Day War in 1967. The site and facilities are currently being administered by the Israeli Civil Administration and the Israeli Ministry of Tourism as part of a national park. The Inn of the Good Samaritan commemorates the setting along the rocky desert road “from Jerusalem to Jericho” that Jesus described in the parable of the Good Samaritan. It was near here that Mount Scopus and the Mount of Olives gave travelers from Jericho their first glimpse of Jerusalem. Today it’s a 40-minute drive between the two cities. Jericho is reputed to be the oldest city on earth. Jericho (the name means “City of Palms”) is mentioned 70 times in the Old Testament. And since Jericho was on the regular route from Galilee to Jerusalem, Jesus passed through it several times. Near the center of the city, a centuries-old sycamore tree recalls the incident in which the tax collector Zacchaeus climbed a sycamore’s branches in order to see Jesus. *Travel in and out of the West Bank is not possible without passing through at least one Israeli military checkpoint. You will need a passport to go through these checkpoints. The cities of Bethlehem, Ramallah and Jericho see large numbers of tourists and there have been no recent reports of any serious incidents involving foreigners. However, you should take extra care when traveling anywhere in the West Bank, and probably reconsider traveling there in times of unrest. Can’t go there in person? 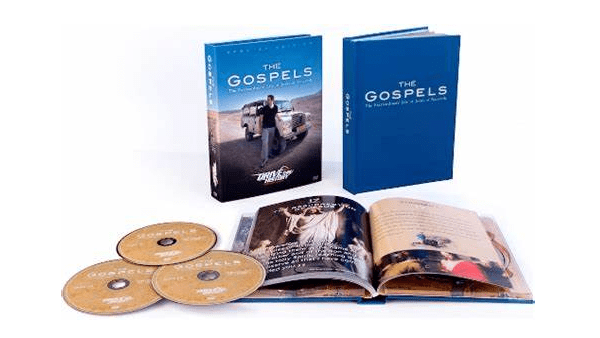 This DVD series is the next best thing! Do you know of some other must-see sites? Please let us know in the comments!